For most companies purchasing office supplies, ink and toner for printers represents a significant portion of their office products budget. Some may spend a little more on copy paper or high quality file folders like classification folders, but the fact remains that keeping your laser and ink jet printers running is a significant expense. While there are no ways around the need for ink and toner to keep your office productive, there are ways to save money purchasing these office supplies. See how spending just a few minutes more buying printer supplies can save you money, and reward you with unexpected benefits. The first tip to saving money is to consider using compatible ink and toner cartridges instead of the brand names. I am very partial to the Innovera line because the savings can be up to 50% versus brands like Brother, and the quality is very high for compatible ink and laser cartridges. The truth is there are some printers that simply don’t work well with any remanufactured ink cartridge brand, but for my money, Innovera is certainly worth trying due to the significant cost savings. If you need help cross referencing your branded cartridges just let us know – we are happy to do it for you! 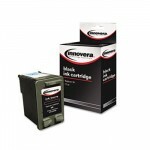 Innovera ink jet and laser cartridges save 50%+ compared to brands like HP. Let us help you cross reference! Next, always try to buy the “XP” or high yield versions of your ink cartridge so you get more mileage out of your cartridges for the money. For example, a standard yield cartridge may give you a print yield of 2000 pages, while the XP version yields 5000 pages and is only 50% more expensive. It’s easy to see that paying only 50% more while getting over 100% more pages is the smart way to shop. Typically multi-pack cartridges, like 2 packs, save you money as well. This tip is the one that requires a little time, but it will pay off for you personally in the end with unexpected benefits. Many manufacturers, especially HP, offer great manufacturer rebate offers that get you real value simply for purchasing items you were going to buy anyway. For example, Hewlett Packard is running two offers currently that are awesome deals. Buy $100 of qualifying HP ink cartridges, and receive a $20 Subway gift card free. That’s 20% savings – click the link for details. Or, buy any two of the same qualifying HP Laser cartridges and get a free $30 gift card to Shell, The Home Depot or Darden Restaurants. What’s not to like about that! If you are a business owner, you can take advantage of these offers and use the gift cards as rewards or incentives for your employees without incurring any costs. That’s a true win/win for your business, and the smart way to gain free products and services for yourself or your company. The last tip is more of a way to save our environment in the long run versus getting short term financial gain. Every office should be recycling their used ink and toner cartridges. Hundreds of thousands of empty plastic cartridges are clogging our landfills, many with shelf lives of way more than 100 years, so recycling only makes sense. Zuma Office Supply has a free ink and toner recycling program that makes recycling simple and easy – all you have to do is throw your empty cartridges in a free box that’s provided. Read more about this earth friendly program here! Used ink and toner cartridges like these are wreaking havoc on our planet. Let Zuma help you recycle - it's free and easy! Consider Innovera compatible ink and toner cartridges. They can save over 50%! Always buy high yield or multi-pack cartridges if available. Look to ZumaOffice.com for manufacture rebate offers, especially from HP. 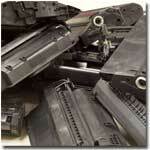 ALWAYS recycle your used ink and toner cartridges. Happy savings and enjoy today! This entry was posted in Office Supplies Shopping Tips and tagged Classification Folders, ink and toner, ink and toner recycling, office products, office products shopping tips, office supplies, Office Supplies Online. Bookmark the permalink. Thanks for the kudos Farah. Zuma knows office supplies and we are always here to help with questions. Do good work! Thanks for that, Starting off a new home business is an exhilarating time but also really quite high priced, for these reasons studying effectively the fundamental office environment supplies and equipment for setting up a enterprise is strongly advised – it is indispensable to decide what supplies the internet marketing business requires and what it does not. Well said! A little time spent studying can save thousands – extremely important during a start-up. Thank you, Karcy. We appreciate your feedback! That’s a great idea for recycling your ink cartridges. There are so many things around the office we can recycle that we often don’t think about.